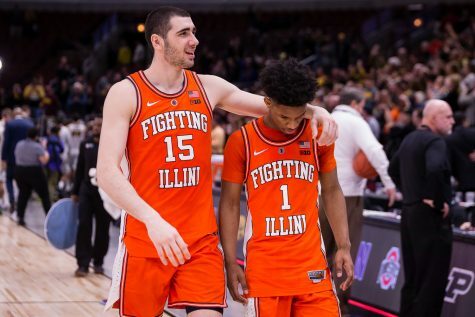 Illinois' Michael Finke hugs Maverick Morgan and Malcolm Hill after defeating Iowa in the second round of the Big Ten Tournament in Indianapolis, Indiana on March 10. 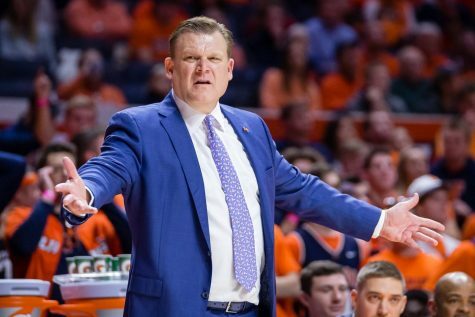 The Illini won 68-66. Malcolm Hill couldn’t buy a bucket. The junior co-captain was just 1-for-8 from the field late in the second round of the Big Ten tournament against No. 20 Iowa. But like all great players, Hill didn’t let earlier shooting woes affect his confidence in crunchtime. With the game hanging in the balance at 66 apiece and 1:15 left, Hill positioned himself at the top of the key, went through the legs, took two lefty dribbles and got to one of his go-to spots – the elbow. He stopped on a dime, losing defender Jarrod Uthoff in the process, and popped the go-ahead bucket. 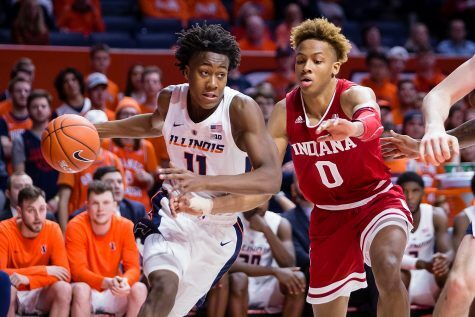 Twelve seed Illinois (15-18) took down fifth-seeded Iowa (21-10) in a 68-66 thriller at Banker’s Life Fieldhouse in Indianapolis on Thursday afternoon. The Hawkeyes had no answer for Hill’s clincher after clawing their way back from an 11-point deficit with four minutes remaining. 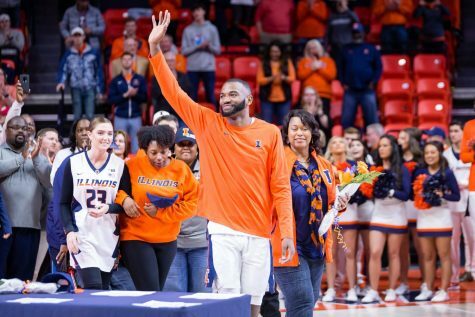 Illinois was hot from the opening tip, picking up where it left off in Wednesday’s 85-52 thrashing of 13 seed Minnesota. The Illini jumped out to a quick 11-4 lead thanks to tough team defense and Maverick Morgan’s physical presence on the offensive end. Morgan got the best of Iowa’s Adam Woodbury, controlling post play with layups and short jumpers. Illinois stretched its lead to 24-13 with 7:40 left in the first half. But then Peter Jok turned into Tracy McGrady. The 6-foot-6 shooting guard rattled off 15 points, including three 3-pointers, in the span of two minutes and 45 seconds. Jok gave the Hawkeyes their first lead of the game, 29-28. After the game, even Illinois guard Kendrick Nunn had to give Jok his props. The teams traded buckets the rest of the first half, and Illinois headed to the halftime locker room up 37-35. Jok continued to drain jumpers in the second period, dropping 12 points in the first 12 minutes of the half. 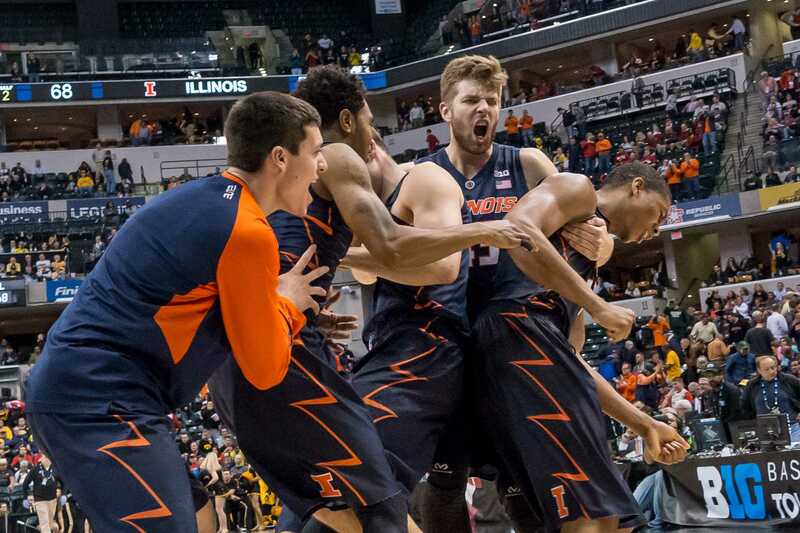 But the Illini had an answer for every Iowa basket. Jalen Coleman-Lands (17 points, five 3-pointers) punished Hawkeyes defenders with his catch-and-shoot ability. Kendrick Nunn (16 points, five rebounds, four assists, three steals) was aggressive both in transition and in the halfcourt, putting the ball on the deck and leaving his opponents in the dust. 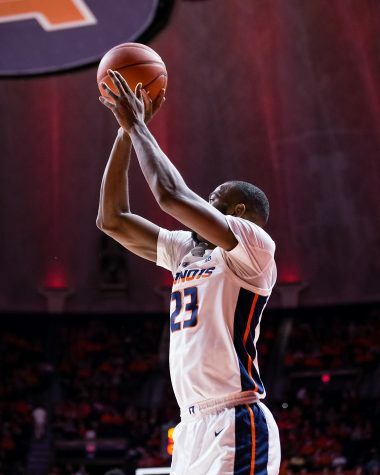 The Illini caught a major break when Jok fouled out with four minutes left in regulation. After Malcolm Hill committed a personal on Nicholas Baer, Jok and Nunn jawed at each other under the basket. 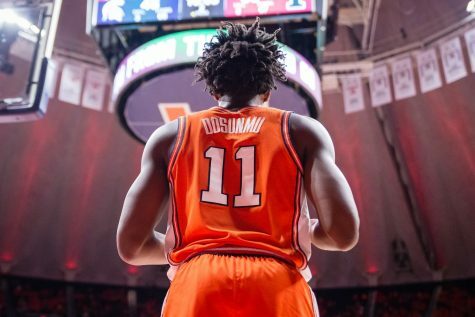 Jok then gave Nunn a shove and was immediately whistled for a technical, which forced him to leave the game with 29 points on 10-of-16 shooting. Uthoff was the only other Hawkeye who did any damage on offense. 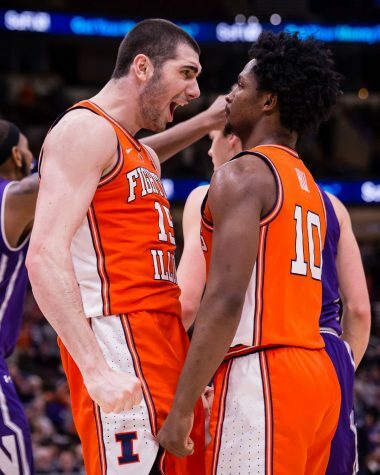 The Wooden Award candidate dropped 21 points, while fellow starters Woodbury, Anthony Clemmons and Mike Gesell combined for just five points. Iowa had two chances to tie or win with under 10 seconds left in the game. Gesell missed a close, contested jumper, and in the mad scramble for the rebound, the ball went out of bounds with 4.8 seconds left. Nunn disrupted the ensuing Iowa inbounds pass, which was intended for 6-foot-8 forward Dom Uhl. Illinois retained possession with 2.6 seconds to survive the late comeback. The Hawkeyes have now lost six of their last eight games. 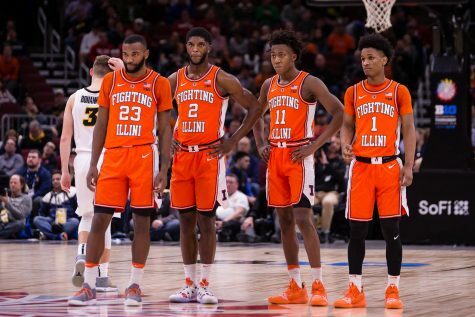 Next up for Illinois is a Friday matchup with four seed Purdue (24-7). 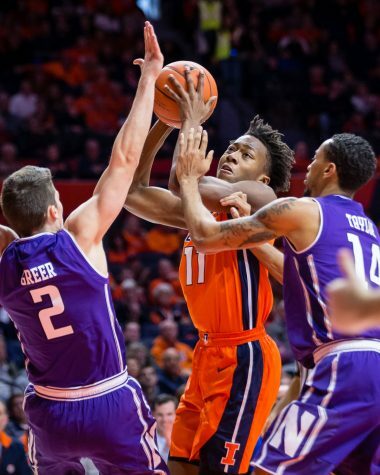 The Illini beat the Boilermakers 84-70 on Jan. 10 at State Farm Center. The last time Iowa and Illinois matched up on Feb. 7, the Hawkeyes ran away with a 77-65 victory. Groce said he’s seeing a major change in his team.